Selena Gomez’s first tattoo is a tiny music note on the outside of her right wrist. Selena told the E online in an interview that she was named after Tejano singer Selena Quintanilla-Pérez, and that music is a big influence for her. Selena also said that there is a bunch of music stuff from her mom that means a lot to her as well. She got the musical note tattoo after she announced that she was going to be taking a break from music so that she could spend more time focusing on her acting carrier. Maybe she wanted the tattoo to remind her that she is rock-star even when she is not spotlight? Selena Gomez’s second tattoo is a Roman Numeral on the back of her neck. Their is speculation as to the meaning of this piece but many believe that it is a tribute to her mother. The artist who gave Selena the tattoo said that she explained that the tattoo was tribute to a family member that meant so much to her. The tattoo is “LXXVI” which is the number 76 for those of you you that don’t know of forgot how to read Roman numerals. Selena’s mother was born in 76, could this be for her? 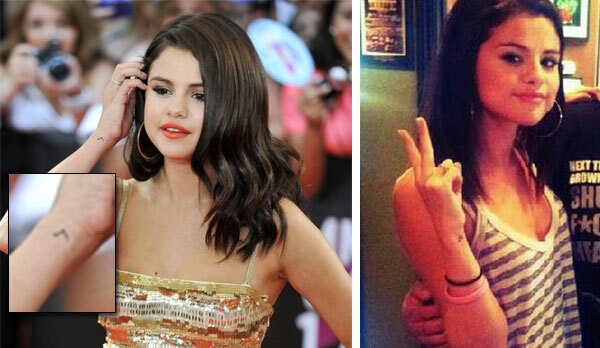 Like many other young 20 something starlets trying to leave their mark in their fans minds, Selena has also been known to have some fake tattoos form time to time, like a cross on her hand and her x-boyfriend Justin Bieber’s name on her wrist. These however were just drawn on with a pen like Taylor Swift has been known to do.